Striker Ricky Miller will not play for Peterborough United for the foreseeable future. The club issued a statement to that effect today (November 8) citing ‘personal issues and related circumstances’. Miller played the final three minutes of Saturday’s FA Cup draw with Tranmere, but was missing from the squad for last night’s Checkatrade Trophy win at Cambridge United, a game he was expected to take part in. 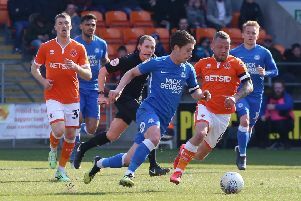 After the game Posh manager Grant McCann said Miller was ill. The Posh statement read: “The football club wish to report that Ricky Miller is unavailable for training and team selection due to personal illness and related circumstances. Miller (28) has struggled on the field since a summer move to his hometown team from Dover Athletic. He has yet to score a goal in nine appearances, five as a substitute.